In 2011, the African continent saw waves of post-election violence, most notably in Cote d’Ivoire and Guinea. The disputes and unrest have arisen from hotly-contested election results, executive strongmen refusing to relinquish power, and persistent political, and ethnic tension, pushing some African countries to the brink of civil war. 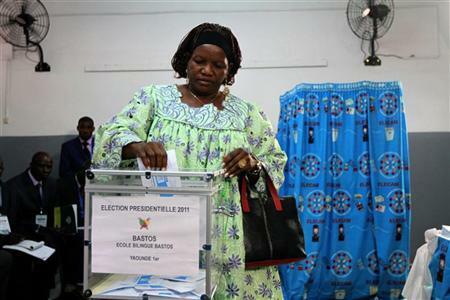 A woman casts her vote at a polling unit during the presidential election in Cameroon’s capital Yaounde October 9, 2011. The people of Cameroon was last due to head to the polls on October 9, 2011 to vote in the country’s presidential election, held once every seven years. Political tensions in the country was high, due to the fact that the incumbent, President Paul Biya, had held power for 29 years. For his first decade in office, Biya maintained power through a single-party autocracy; in 1992, he reintroduced multi-party elections, but his victory at the polls that year was marred by national and international charges of electoral fraud. In 2008, he abolished term limits via a constitutional referendum, effectively enabling him to retain power indefinitely; consequently, this sparked riots across the country. 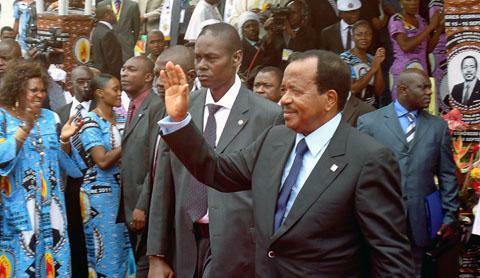 Today, many Cameroonians remain dissatisfied with both his governance and his prolonged presidential tenure. Citizens are calling for a fresh change in leadership to break economic stagnation and limit the boundless corruption that permeates all levels of Cameroonian public and private life. However, the 2011 election saw 29 candidates standing for election—several of them planted by Biya himself to detract support from the opposition before allying with Biya at the last minute. It seemed ulikely that the Cameroonian President would change, and Paul Biya did indeed remain in power for yet another term in office. The 2011 presidential elections, combined with the 50th Anniversary of Southern Cameroon Independence, presented a bastion of political tension that could have erupted into violence. Nonviolent Exercise of Civil Liberties: The elections and their results will be likely to produce dissatisfaction across the political spectrum. According to the Preamble of the Cameroonian Constitution, citizens have the right to expression, association, and assembly. However, during the campaign period, the actual election, and the weeks leading up to the announcement of the results, all citizens should express their opinions in a nonviolent manner to avoid any unrest and unnecessary loss of life. Nonviolent Protection of Civil Liberties: Since Cameroonians have the rights to expression and assembly, government authorities should work to protect those rights in a nonviolent manner while working to protect the population from any violence that may occur. The police and gendarmes have the duty to ensure the safety of the population while, at the same time, making sure citizens can actively protest and express their discontent. Free and Fair Elections: As a self-proclaimed republic, Cameroon’s government draws its power from the will of the people. It follows that all elections should be transparent and fair, devoid of the specters of vote-rigging, intimidation, and other illegal electoral maneuvers. It is the responsibility of the Cameroonian government, the Elections Commission, and any independent observers to ensure that the elections and the vote-counting that follows proceeds in the proper fashion.